On both the left and the right, there are divides about how immigrants affect American society. On balance, public views of immigrants are more positive than negative. By a margin of 57% to 35%, more say immigrants today strengthen rather than burden the country; by a similar 59% to 35% margin, most believe that the growing number of newcomers strengthens society rather than threatens traditions. On both questions, the three groups on the left are in general agreement that immigrants strengthen the country. But Hard-Pressed Skeptics, a Democratic-leaning group, take more conservative views on both measures. About eight-in-ten (79%) say immigrants are a burden because they take jobs, housing and health care, while only 14% believe immigrants strengthen the U.S. because of their hard work and talents. Most Hard-Pressed Skeptics (72%) also say newcomers threaten traditional American customs and values. The solidly Republican Steadfast Conservatives view immigrants as a burden (73%) and as a threat to traditional values (81%). However, this contrasts with Business Conservatives, who mostly believe that immigrants strengthen the country (64% vs. 21%) and American society (72% vs. 20%). On immigration, Young Outsiders are the most conflicted. About as many believe immigrants strengthen (48%) as burden (43%) the country. On the issue of traditional customs and values, a slim majority says newcomers strengthen society (55%), while 39% see them as a threat to traditional values. When it comes to immigration policy, six of the seven groups favor a pathway to citizenship for immigrants here illegally as long as certain requirements are met. By a roughly three-to-one margin (76%-23%), the public thinks unauthorized immigrants should be eligible for citizenship. More than eight-in-ten Solid Liberals (96%), Next Generation Left (88%) and Faith and Family Left (85%) say immigrants living in the country illegally should be eligible for citizenship, if they meet certain requirements. 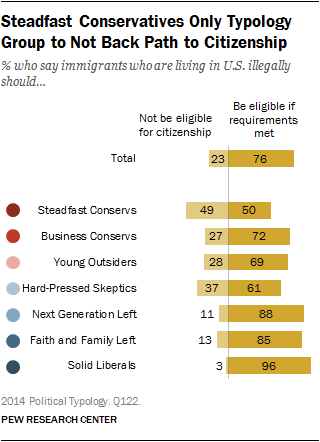 On the right, Business Conservatives (72%) and Young Outsiders (69%) also are supportive of a pathway to citizenship. And Hard-Pressed Skeptics – who hold negative views of immigrants generally – support a pathway to citizenship by a 61% to 37% margin. Steadfast Conservatives are the only group where most do not back a way for immigrants currently in the country to stay here legally. As many say immigrants now living in the U.S. should not be eligible for citizenship (49%) as say they should be eligible for citizenship, as long as certain requirements are met (50%). When it comes to racial progress in the U.S., the public is evenly divided about whether the country has made the changes needed to give blacks equal rights with whites. About half (49%) say the U.S. has made the necessary changes, while 46% believe the country needs to continue making changes. 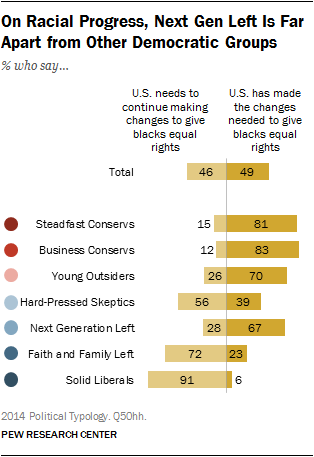 About eight-in-ten Business (83%) and Steadfast Conservatives (81%) agree that the U.S. has made the changes needed to give blacks equal rights with whites. At the other end of the ideological spectrum, 91% of Solid Liberals and 72% of the Faith and Family Left take the opposite view and say the U.S. needs to continue making changes to give black equal rights with whites. Notably, a 67% majority of the Next Generation Left — the youngest Democratic-leaning group — says the necessary changes to give blacks equal rights with whites have been made, while just 28% say more needs to be . While the public is divided over whether additional societal changes are needed to further racial equality, most do not believe that discrimination is the main reason why many blacks can’t get ahead today. By more than two-to-one (63%-27%), the public says blacks who can’t get ahead are mostly responsible for their own condition. This view is widely held across the three Republican-oriented groups, with at least eight-in-ten taking this position. Smaller majorities of the Democratic-leaning Next Generation Left (68%) and Hard-Pressed Skeptics (63%) say that blacks who can’t get ahead are mostly responsible for their own condition. A 57% majority of the Faith and Family Left (the most racially diverse group, 30% of whom are black) also say that blacks who can’t get ahead are mostly responsible for their own condition. But Solid Liberals see the issue differently. 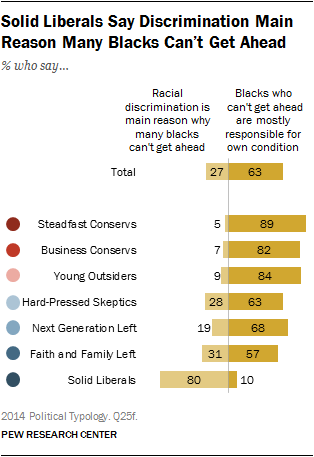 Among this group, eight-in-ten (80%) say racial discrimination is the main reason why many blacks can’t get ahead, making them at least 49 points more likely to hold this view than any other group. A vast majority of Solid Liberals believe in the merits of college affirmative action (87%), as do at least seven-in-ten of those in the three Democratic-leaning groups. The Young Outsiders also are mostly supportive of campus affirmative action: 62% say it’s a good thing and just 33% say it’s a bad thing. Steadfast Conservatives and Business Conservatives, meanwhile, think these programs are a bad thing by a two-to-one margin (60%-31% and 60%-30%, respectively).